The Duke of Edinburgh has bowed out from his long association with the Royal Marines after handing over his role as its Captain General to Prince Harry. 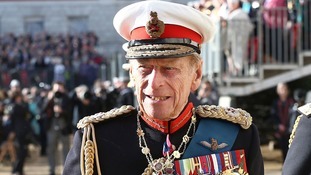 Philip's last solo public duty before retiring in August was to take the salute from a group of fundraising Royal Marines and on Tuesday he was joined at Buckingham Palace by his grandson Harry, as he assumed his new position. After more than 64 years as Captain General, a role which dates back to 2 June 1953, when he was appointed in succession to the late King George VI, the duke relinquished his position. The Queen has been pleased to give her formal approval to the appointment of His Royal Highness Prince Henry of Wales as Captain General Royal Marines." Philip's final duty as Captain General was to receive Major General Robert Magowan, the outgoing Commandant General Royal Marines, and his replacement Major General Charles Stickland. Harry was also at the Buckingham Palace event and the foursome posed for a photograph to mark the occasion. The Queen's Consort announced in May he would be retiring from royal engagements after more than 65 years supporting the monarch in her role as head of state and attending events for his own charities and organisations. As a former Royal Navy officer it was fitting that Philip's last public solo event featured men from the Royal Marines, an integral part of the Navy. On 2 August in Buckingham Palace's forecourt Philip celebrated the achievements of the Royal Marines who had taken part in the 1664 Global Challenge, a series of strength and endurance feats raising funds and awareness for the Royal Marines Charity. It was the last of his 22,219 solo official engagements, carried out since 1952. The Duke has joined the Queen at a number of events since then and in June spent two nights in hospital being treated for an unspecified infection.